At an open house on December 4, Ford Motor Co. showcased its Advanced Manufacturing Center, a $45-million, 100,000-sq.-ft. facility in Redford Township, MI, that the company opened this past summer to help push new technologies into manufacturing operations. During 3D Metal Printing’s tour, we glimpsed the automaker’s extensive additive-manufacturing (AM) development work—including tools, jigs and fixtures; robotic end-of-arm tooling; and production parts—on a variety of metal- and resin-AM machines. On the metals side, the center features a Desktop Metal Studio System currently running 17-4 stainless steel as well as two SLM Solutions 500 HL units (delivered only a few weeks back), one running AlSi10Mg aluminum alloy and the other 316L stainless. Pictured is a metal tool—Ford’s first, according to Harold Sears, additive manufacturing technical leader for manufacturing—that provided a rapid payoff for Ford via the SLM machine. The tool slips over the input shaft of a transmission, allowing a technician to turn the transmission by hand via a ratchet attachment to spin and correctly balance and position the transmission. It’s made of 316L to replace a costly hardened-tool-steel predecessor that required extensive lead time. 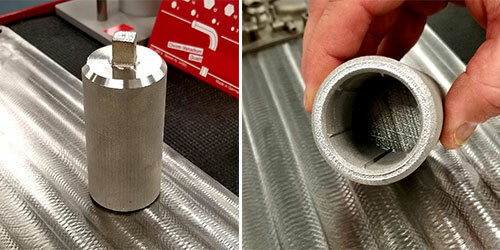 Despite concerns that the softer stainless-steel internal splines (also pictured) would wear quickly, the tool has been able to turn more than 100 transmissions without replacement. Sears relates that Ford employs a couple of metal-AM machines in Europe, but those residing at the Advanced Manufacturing Center are the company’s first in North America. “We have printers in 30 different manufacturing facilities around the world, and run a total of about 100 throughout the company,” says Sears, noting that the company holds contests to help promote 3D-printing technology and includes training courses and opportunities to tinker for its UAW personnel. The resin machines have helped immensely with prototyping, according to Sears, who notes that Ford has had a stake in AM dating to its use of stereolithography equipment a quarter-century ago. Today, resin parts find their way into numerous prototyping and assembly operations, and have even entered the production arena. Ford’s very first production part: a near-automotive-grade plastic plug that inserts into the IP for Ford Rangers to be shipped to China. Another: a brake bracket that replaces two left- and right-hand brackets for the Ford Mustang Shelby GT 500, which will be unveiled at the Detroit Auto Show in January 2019. Besides its AM capabilities, the center also includes augmented and virtual-reality technology under development to assist in assembly-line work-instruction training and line layout, as well as collaborative-robot cells being tested and refined for use in a variety of applications. Though the printers are expected to be a mainstay at the center, other technologies will be introduced and deployed as needed. “What you see in here six months from now may be quite different than what you see today,” Sears offers. See also: SLM Solutions NA, Inc., Desktop Metal, Inc.